After a year of trying out new makeup, here are my best beauty products of 2018. From makeup to skincare, we’re covering it all. Note: not all of these products launched in 2018, but a handful of them did. If you’re looking for a pigmented-packed liquid glitter eyeshadow, this is it. Long lasting. Minimal fallout. Maximum glitter. Do I need to say more? I’m obsessed. For the longest time, I was wondering how girls created perfect winged liner that looks smooth and intensely black. I’ve tried so many liners and none of them really did it for me until I came across this one. The felt tip liner is a game changer. This matte lipstick is so comfortable on the lips and is not drying unlike other matte formulas. I find that it dries down, but does transfer slightly while eating. However, when I look at my lips afterward, they look as if no product came off. I don’t know what kind of magic Pixi put in here, but it’s incredible. Gloss Bomb is hands down the best lipgloss I’ve ever tried. This is my go-to lip product and I constantly have it in my purse, which is how you know I really love a product. I wear it all the time. It’s not sticky at all, leaves my lips looking juicy, and adds some hydration. Everyone needs one in their life. If you’ve been following me since about two years ago, you’ve seen the evolution of this highlighter go from brand new to panned in my makeup videos. This is the most beautiful highlight I’ve ever tried and it has a silky smooth texture that glides on flawlessly on my face. It’s literally the best. I can’t get enough. Secret’s out: I fill in my brows with a $1 brow pencil and it’s better than high end brow pencils I’ve tried. I apply the lightest amount of pressure when using this pencil because a little goes a long way. If your brows are relatively full like mine and you want to fill in sparse areas, I highly recommend this brow pencil. Listen, my brow hairs have a mind of their own, especially when it comes to the inner part, and Benefit knows how to tame them. The clear brow gel keeps my hairs in place all day, helping them look properly shaped. I wish I knew about it earlier. This is one of those “my skin, but better” products I like using on minimal makeup days when I want lightweight coverage that neutralizes redness and adds glow. Plus, the tiger grass makes it feel super soothing on my sensitive skin. I opt for this on days I don’t feel like wearing foundation, because it’s basically like foundation. I mainly use this as an eyeshadow primer because I hardly use concealer on my face ever since Drunk Elephant cleared up my skin, so I can’t really speak on how it applies on the face. However, this serves as an excellent eyeshadow primer for me that provides lightweight full coverage to conceal the veins on my eyelids and acts as a base. After just one day of use, this instantly became my new favorite and holy grail foundation. I always thought of powder foundations as having sheer coverage, but boy, was I wrong. This powder foundation can be built up to full coverage and makes my skin look so flawless. Like, my acne scars practically disappear. I don’t even set my face with powder anymore because this is basically like a 2-in-1 foundation and setting powder. Who would’ve ever thought someone with oily skin wouldn’t have to set their face with powder? Certainly not me. I’m still amazed by the flawless finish every time I use this. You can’t have peanut butter without jelly. Well, you can, but it wouldn’t be PB&J, you feel me? This primer is the jelly to the powder foundation’s peanut butter. Enough said. Oh my goodness, where do I begin? This is my current favorite drugstore mascara because the formula is so smooth and comfortable, adds natural looking length to my lashes, and doesn’t clump or transfer on me. Do you know how hard it is for me to find a mascara like that? I feel like I hit the jackpot. The ultimate skincare guru’s secret to masking in public without anyone knowing: the Jet Lag Mask. This ultra-hydrating face mask is white when squeezed out of the tube, but goes on clear, making it perfect for masking on the plane. I love taking it with me on travel and even use it at home all the time. This mask is super versatile as it can be used as a makeup primer, overnight mask, under eye cream, 10 minute mask, daily moisturizer, or whatever you want to use it as since it doesn’t need to be washed off unless you want to. Drunk Elephant The Littles has truly worked wonders for clearing up my acne-prone, sensitive, oily skin. Literally nothing has worked as quickly or well as Drunk Elephant has on my acne. Within a week, my skin started clearing up. I cannot say enough amazing things about their products and highly recommend them to everyone. No, really. Ask anyone I know. It’s all I talk about! My skin drinks up this lightweight, non-sticky moisturizer and feels so refreshed afterward. The formula has a light floral scent that smells so luxe and doesn’t irritate my sensitive skin at all. It’s a definite winner! I don’t even know where to begin. What would I do without micellar water? This is the ultimate lazy girl’s makeup remover and has been my go-to on several nightly occasssions when I didn’t feel like washing my face with a typical liquid cleanser. All I do is squeeze some onto a cotton round, wipe it all over my face, and boom, clean skin. Plus, it’s fab for taking off Pixi’s Liquid Fairy Lights glitter eyeshadow and any lipsticks that tend to be harder to remove. 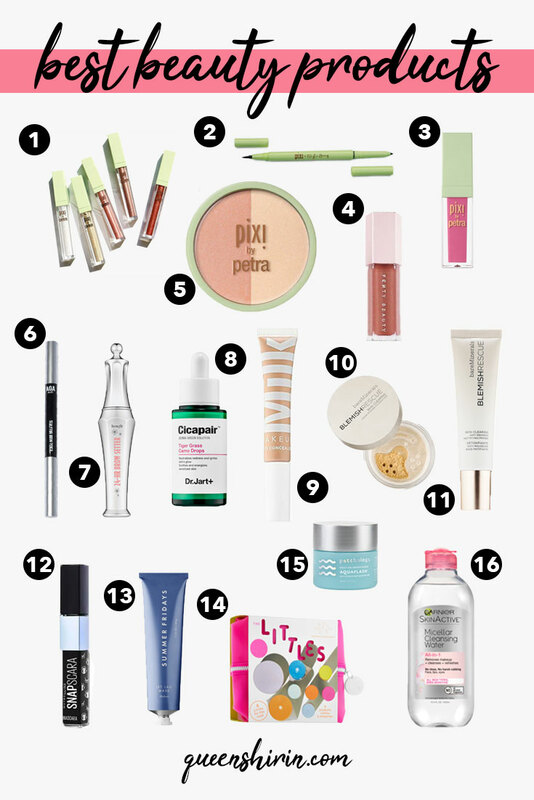 What were your favorite beauty products of 2018? Let me know in the comments!